Ironically, it is from corruption-ridden Waikato University, Hamilton, New Zealand, that Professor Jacqueline Rowarth is reported to have said that what passes for school or even university education would be better suited as after-school activities. Yet even this honourable scholar declined to comment when I asked what she thought of Waikato’s antics in regard to the academic fraudulence of one of its alumni, Roel Van Leeuwen, and the antics of his supervisor, Dov Bing, an issue I had raised in 2008 amidst considerable news media publicity, most of it of an inadequate nature. Professor Rowarth stated that she was not at Waikato at the time. Apparently, having an opinion as to whether fraud and lies are right or wrong is something that cannot be definitively decided. However, Professor Rowarth’s reply was typical of the reaction of New Zealand academia in regard to the Van Leeuwen fraud, which universally either remained mute or via their trades union threatened action when the shabby careers of several “eminent scholars” (sic) and their protégés stood a narrow chance of being exposed. While I do not have the disadvantage of a New Zealand tertiary education, I have published within the course of a few years more peer-reviewed papers than most New Zealand academics, and am in close communication with some of the truly great scholars in the world, as indicated by some of those who have appraised and even written prefaces to some of my books. I therefore know how to judge the merits or otherwise of what passes for “scholarship.” And in the social sciences – as distinct from the exemplary physical sciences – New Zealand ain’t got it. It is enough to string a list of liberal-left clichés together to have a dissertation even to doctoral level, regarded as meriting the highest accolades among academicians as they welcome yet another mediocrity to their ranks. What Passes for a Doctoral Thesis These Days? As to who am I? I am the holder of a Ph.D. which is on the analysis and dissection of conspiracy theories. So I’m quite qualified to dissect and analyse yours. Dr. Dentith directed said bigots to his Ph.D. thesis published on the internet, so that all could marvel at his scholarly acumen. Dr. Dentith is actually a defender of “conspiracy theories” but only those coming from part of the Left, while those on the Right are delusional. So what does it take to garner a Doctorate from New Zealand academia these days? Answer: 57,000 words, utilizing 60 secondary sources. Dr. Dentith also states often, again condescendingly, to all the uneducated bigots posting on John Ansell’s blogsite that they do not understand the processes of “peer review.” However, one might look in vain for Dr. Dentith’s own published record of peer-reviewed papers. A dissertation based on reviewing 60 books and articles, and a paper delivered at a conference, appears to be about it. While a Ph.D. thesis in physics might be as short as a single page setting forth a new equation, for example, one should surely expect something more substantial in the social sciences, when the thesis is based on a review of some books without adding anything significantly new to the advancement of knowledge? One of the most disgraceful acts of academic corruption involved the malicious treatment of Dr. Joel Hayward. In 1993 Hayward completed an MA thesis on the literature of holocaust revisionism. Hayward is of Jewish descent, was a member of the New Zealand Friends of Israel, and a co-founder of Opposition to Anti-Semitism Inc. Yet in the course of his studies he had come to regard holocaust revisionist literature as making some valid points. It was a controversial conclusion that nonetheless garnered Hayward First Class Honors. 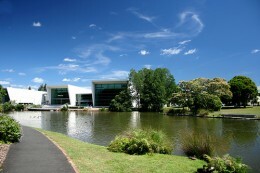 When in the year 2000 a University “embargo” on public release of the thesis had expired, the New Zealand Jewish Council, and Professor Dov Bing — keep that name in mind — of Waikato University, launched a campaign to have Hayward’s Masters revoked, on the spurious grounds of “dishonesty.” The matter was made public by Bing, presumably on the safe assumption that the news media could be relied upon to mindlessly smear Hayward, which it duly did. It should also be noted here that Bing, one of New Zealand’s primary apologists for Israel, has a habit of “leaking” information to the news media. Although Bing et al. failed to have Hayward’s Masters revoked, the Working Party Report of the external enquiry agonized over Hayward having been permitted to undertake that course of research in the first place. Hayward was harassed, threatened, and had several nervous breakdowns. He had to resign from his position as lecturer of defence at Massey University, Palmerton North, and became unemployable in New Zealand. A few years later he went to the UK and obtained a prestigious post in academe. As for Dov Bing, he was not about to let the matter drop, despite Hayward’s retraction of some of his conclusions in the Thesis. Over the course of more than a decade Bing has continued to milk the Hayward matter for all its worth. The article claims that Dr. Hayward, Dean at Cranwell College, where British pilots are trained, is a convert to Islam who has taken a critical line on the NATO and UN bombing of Libya, and questioned whether the British air force should be placed at the service of a rebel army. Hayward is reported to have written in a magazine article that: “The West runs the risks of its good intentions (and inconsistencies) leading to distrust,” in its bombing of Libya. In a letter to The Mail on Sunday entitled “The Air Force Ayatollah,” one senior officer expressed concern that Dr. Hayward was focusing more on ‘Islamist activities that are nothing to do with the RAF’. He also accused him of giving Muslim cadets preferential treatment and making other students take a ‘softly, softly line when writing about Muslim terrorists/Islamist extremists’. Another officer claimed cadets and lecturers ‘are in fear’ of expressing anything that might be construed as anti-Muslim sentiment. ‘Anyone who fails to follow the line that Islam is a peace-loving religion is hauled into his office for re-education,’ he said. Last night Dr. Hayward said he did not ‘recognise’ the allegations. Dr. Hayward was appointed to RAF Cranwell in 2007, but was investigated the following year over complaints of ‘harassment and bullying’. It is not clear what became of the investigation. He is employed not by the RAF but by King’s College, London, which runs academic courses at Cranwell. The questions that should arise are not in regard to the dubious claims against Hayward’s character, but about whether complaints that started the year after his appointment to Cranwell were motivated by his having displeased certain interests in New Zealand. Given what this writer personally knows about those involved in the harassment of Hayward in New Zealand, I feel that it is a legitimate question. In May 1992, the university received a letter from an organisation called Opposition to Anti-Semitism Inc (OAS). The group, based in Christchurch, was concerned about the direction Dr. Hayward was taking in his then half-completed thesis. Ironically, OAS had been formed a year earlier by Dr. Hayward with Yossie EtzHasadeh (previously Philip Woodfield of Christchurch, now in Israel) and Denis Green. The organisation’s goal was to monitor anti-Semitic groups in New Zealand and warn people about Holocaust revisionism. Several members were converting to Judaism. Joel Hayward resigned from the group before he started his thesis. He says he left OAS because of a personality clash. OAS members soon became worried about the path Dr. Hayward’s thesis was taking and arranged to meet him. Dr. Hayward says he went along on January 30, 1992, to what he thought was an ordinary afternoon tea with friends. As they talked about his half-completed masters thesis a video camera hidden behind a hollowed out book recorded the entire conversation. The group sent Canterbury University registrar Alan Hayward (no relation) parts of the transcript with a letter detailing concerns about Joel Hayward’s views on the Holocaust. Dr. Hayward did not find out about the video until two months after it was made. He considers the taping dishonest and unfair and says he nearly had a breakdown as a result. It was as a religious studies lecturer at Waikato University that Green is acknowledged by a certain Roel W. Van Leeuwen as being “the man who planted the seed” for a fraudulently contrived Masters thesis that Van Leeuwen completed in 2008. Furthermore, Van Leeuwen’s co-supervisor was Professor Dov Bing, lecturer in Political Science and Public Policy at Waikato University. Hence, enter again, two primary characters involved in the Hayward affair. Dov Bing is a very active Zionist and apologist for Israel. He has been involved not only in the Hayward matter, but in the debacles concerning German student Hans Kupka, and Malcolm Evans, an award-winning cartoonist who had his eminent career ended due to his criticism of Israel in his Auckland Herald cartoons. It is in the matter of the Van Leeuwen thesis that I know something personally of the nature of Bing’s attitudes and tactics. The events against Hayward, Kupka, and starting from 2008 against this writer, follow similar scenarios. Most of the garbage I received was unimaginative and only semi-literate, and phrases like “hope you die,” “you’ll get yours,” “die scum!,” “rot in hell,” and “we’ll be waiting for you outside your work” seemed so common that, had the calls and mail not come from different parts of New Zealand or been sent from many different email addresses, I probably would have concluded that they came from one small group of hate-filled people. Some of this mail even came from a senior academic at another New Zealand university, and, with full specifics, I reported that academic’s behaviour and mail to the Working Party. I felt so distressed by some of the mail that, in a letter to the Head of the Working Party, Sir Ian Barker, dated 1 August 2000, I pointed out my concerns. Sir Ian told me during our interview on 10 October that he shared my grave concerns. 2.47: On 2 October 1999, Dr. Hayward received what he describes as the first of many e-mails from Professor Dov Bing, Professor of Political Studies at the University of Waikato. . . . Dr. Hayward claimed that he had received several nasty e-mails from anonymous persons and was concerned at what action might be taken by Professor Bing and NZJC [New Zealand Jewish Council] . . .
On April 11 the story broke in Nexus in an article full of inaccuracies. These inaccuracies result from the fact that the article is based on the same package of materials that was circulated by Dov Bing to all PGSC members and members of the University Council on or around the same day as the Nexus article appeared. I sent an e-mail round the PGSC members cautioning that the materials contained a large number of distortions and inaccuracies and that it was unwise to discuss this matter on e-mail. During March and April, some of those charged with ensuring that due process is followed have been subjected to harassment and threats and have had to seek support of various kinds. I am prepared to speak only for myself, to whom the damage has been comparatively very minor. You will note that, despite my requests to Dov [Bing] that his correspondence and queries be directed to the Chair (the usual convention), correspondence on this matter continued to be addressed to me – with the result that inaccuracies and distortions of the facts have been attributed to me and circulated to the University Council and the media. My name has therefore been published in Nexus (April 11) and circulated round Council. Susan Edmunds, “Our Degrees,” Herald on Sunday, September 30, 2012. Jonathan Milne, “Wanted: inquiring minds,” ibid. Fudge’s article appeared in the journal of the History Department, Canterbury University, Christchurch, History Now, vol. 9, No. 2, May 2003, pp. 12-21. However, the University took fright after pressure from unnamed sources, destroyed the entire edition in a New Zealand example of book burning, and published another edition that excluded Fudge’s article. Fudge resigned his post at the University in protest. “Research Publications for Dov Bing,” Waikato University, http://www.waikato.ac.nz/php/research.php?mode=show&author=412&mode=show&page=1As will be seen, his peer-reviewed papers are quite scant. S. Scanlon, “Making History,” Christchurch Press, May 20, 2000. R. W. Van Leeuwen, Dreamers of the Dark, MA Thesis, Waikato University, Hamilton, New Zealand, 2008, i, ii. Kupka was a German student who sought to undertake his doctorate on the contribution of German language in New Zealand, but who allegedly had right-wing connections (Republican Party) in Germany. Professor Middleton, Kupka Report, Appendix Q, “Confidential Memo,” May 1 2000, To Members of the Post Graduate Studies Committee, http://unipr.waikato.ac.nz/news/kupka_report/pdf/q.pdf. Published: January 7, 2013 | This entry was posted in North American New Right and tagged academia, articles, Dov Bing, Joel Hayward, Kerry Bolton, Matthew Dentith, New Zealand, North American New Right, originals, political correctness. Both comments and trackbacks are currently closed. Dr. Dentith is actually a defender of “conspiracy theories” but only those coming from part of the Left, while those on the Right are delusional. Do you have a reference for that? I quite happily take people to task on both sides of the political spectrum when they offer up vapid conspiracy theories and, on more than occasion, I’ve said that a specific claim of conspiracy offered by someone on the right may well turn out to be a plausible explanation for some event. I do not have a PhD but I am an educated person and I have read Mr. Bolton’s work. I follow this site regularly. Since you are interested in “right-wing conspiracy theories”, perhaps you have heard that many white “racists” believe that white people have been targeted for genocide by mass immigration into ALL white countries and forced integration with non-white immigrants. As I’m sure you know, whites are effectively precluded from organizing in our own best interests or even socializing together for fear that some “anti-racist” will inform our employers, or even the FBI, that we are associating with “racists”, which so far as I can tell means a white person who wants white people to continue to exist. (11) Effekten av SD var att vi fick en politik i motsatt riktning, förklarade statsministern belåtet. Once again, I ask you, in all good faith, do you believe I am “paranoid” for believing that these statements are evidence that “demographic change” throughout formerly Western countries is not “just happening” but rather a conspiracy to finish off white people? How should I, as a white person, interpret these statements? Perhaps the most outrageous thing about the ethnic cleansing of whites in ALL white countries is that whites are manipulated into accepting the end of their race and cultures by way of collective historical guilt. Yet non-whites hear the same anti-white propaganda that is targeted at whites, which of course winds up making non-whites hate white people. The same rhetoric that is used to soften up whites for cold, non-violent genocide could very well incite non-whites to hot genocide against us. “Dehumanization” is Stage 3 of Genocide according to Genocide Watch. Of course, our achievements and contributions to human welfare are simply ignored or attributed to dumb luck. I sincerely hope you reply as I am very much interested in your point of view on these matters. Hi Just. A great post. A great description of white plight today, the challenges we face and the tactics used against us. Clearly you’re not just another pretty face. My experience with people like Dr. Dentith when it comes to the questions you pose, is that he will disappear. Those questions ARE the questions. I agree with Erfow, that was an EPIC post, JustAWhiteMom! I’m making sure to save that to my hard drive, memorize some of the quotations, and share it with others when the topic of Western racial demographics arises. I have noted that such people tend to be hypocrites, obscurantists, and ethnomasochists. They are infected with what Louis Pauwels aptly called “mental AIDS.” With regard to race, they often claim that race doesn’t exist and doesn’t matter, and that our society should be color-blind, but they don’t act as if they actually believe this: they are obsessed with race, they advocate all kinds of discriminatory and genocidal policies against Whites, and they are quite proud of what they have brought about in places like Rhodesia and South Africa. Would it be too much to say that these witchdoctors deserve to be “necklaced” (i.e., have a petrol-soaked tyre tied around their neck and set alight) to give them a taste of their own medicine? This remark might sound extreme, but considering what these people have done and are doing collectively, it is actually quite moderate. JustAWhiteMom, your was a masive post. You should expand it a bit more, write a brief intro and submit for publication as an article here at CounterCurrents, or Occidental Observer, or AltRight or any other place that takes it. I am sure you will succeed. If you can make an article out of it, it will be easier to find and reference in the internet. I find your grounds for causally dismissing my doctoral work interesting. For one thing, for your argument to work, you would need to show that you are comparing like with like. In order to say my thesis is sub-standard merely because it is concise and relies on what you consider to be a small sample of the available academic literature on conspiracy theories, then you would need to compare it to other contemporary PhDs in Philosophy and ask “Is this one representative?” (comparing my PhD with a PhD in the Social Sciences is a bit of a stretch, not only because it is not obvious that Philosophy is a Social Science and because the Social Sciences is a broad church with a lot of different research methods and writing styles). Now, given that my examiners had no trouble with either the word count or my referencing, I can only surmise that you’re simply trying to find something trivially wrong with my work because you aren’t going to grapple with my arguments. Indeed, your comments suggest that you haven’t read my thesis in any depth. Why do I think that? Well, firstly, my thesis, like most doctoral dissertations, is front loaded with the standard literature review (the bit you seem to have trouble with) whilst the second half of the thesis features, predictably, fewer references and, rather, relies on advancing original arguments for my novel contribution to the debate on the warrant of conspiracy theories (namely, how to gloss the inference to the best explanation such that we don’t immediately rule out conspiracy theories as being in the pool of candidate explanatory hypotheses considered “best”). If you can point towards existing, prior literature in Philosophy which deals with the same arguments and reaches the same conclusions, I’d be happy to hear about it. Certainly, my examiners thought the work was novel enough to recommend I be awarded my PhD, and given that they a) didn’t earn their PhDs in Aotearoa me Te Wai Pounamu (New Zealand) and b) at least one examiner was not local, you can’t really blame a conspiracy of local academics for awarding me my doctorate despite what you take to be its poor credentials. So you want to change the name of New Zealand to some Maori name? Why don’t you really get serious and just go back to Britain – you are White and therefore an invader. Your whole life and career are made possible by the conquest of New Zealand. Until you acknowledge that, you have no right to enjoy the fruits of the conquest. If you enjoy the fruits of the conquest, you must support the conquest – or be existentially inauthentic. Instead, you want to throw other Whites to the wolves and transform New Zealand into part of Asia. The Maori don’t want that btw – as if you really care about them either. Absolutely. Truth be told, if whites had a great leader, able to show the way to other European-Americans, so many heads would role in white Western nations, mainly those heads of the traitors that are selling out their inheritance. Peace. I recently saw a CBC documentary called “Conspiracy Rising”, which features several conspiracy theorist experts. This seems to be an up and coming profession. This profession was apparently invented by Michael Shermer of Skeptic magazine. After reading through some of your thesis, it seems to me that you are only putting a more philosophical dress on the same ad hominem strategy. 1. speak with an air of bemused academic curiosity. 2. completely ignore the evidence presented by the “conspiracy theorists”. 3 present nebulous straw man arguments and beliefs as being that of the conspiracy theorists 4 conflate “conspiracy theory” with every type of unconventional belief; from life on other planets to some movie’s theory of who killed Mozart. The essence of the thesis is summed up in your term for it’s subject; the dismissive epithet “conspiracy theorist”. The argument boils down to a pure ad hominem. There is no originality, philosophical or otherwise, in any of this.